The frank sentiment of "A Global Warning," one of the prescriptive taglines for Al Gore's recent documentary An Inconvenient Truth, is at the heart "Ecotopia," the second ICP triennial of photography and video. Yet the descriptive and thorny ideas in this sizable exhibition—from the "nomadic postconsumers" of the future (Mary Mattingly) to the black-market trade in endangered species (Patrick Brown)—save it from moralistic didacticism and fear-inducing value judgments. With an empathetic approach, the one hundred works sustain a broad discourse on the politics and aesthetics of nature. There are several affinities among the works on display here, but they are not to be found in utopian thinking. 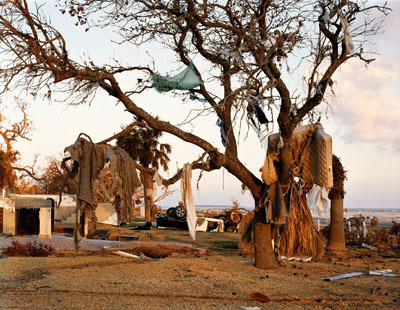 Depicting the fragile state of the American environment in their photographs, Mitch Epstein and Clifford Ross invigorate the exhausted genre of landscape painting. Diana Thater and Mark Dion, symbolically toeing the line between obsession and conservation, provide surveillance views of wild animals. A digital slideshow of recent ecological disasters is harnessed inside one room, with images of Hurricane Katrina's aftermath by photojournalist Vincent Laforet and of the Inupiat people (the first victims of global warming) by Gilles Mingasson. Marine Hugonnier and Doug Aitken hint at the paranoid isolation of blank space and futuristic "meta-cities." But is it really so strange? In this long-winded ride through the knee-shaking sublimity of flora and fauna and the disastrous exploitation of both, the curators seem to question how far empathy really takes us, and how much longer it will be before the future is now.